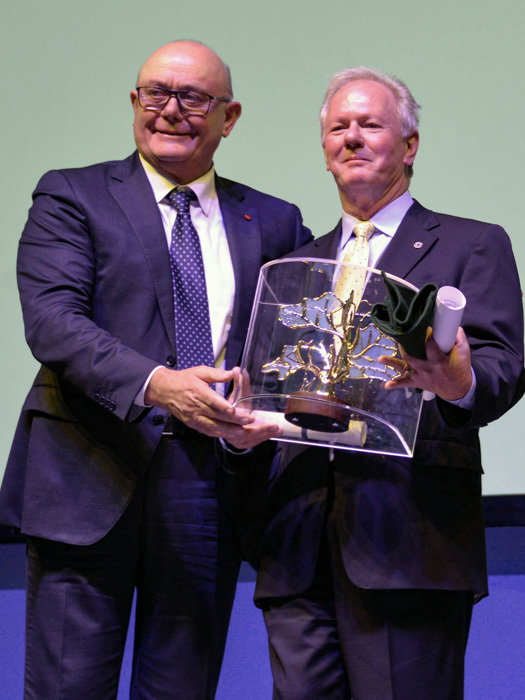 Newton B. Jones, Bank of Labor Chairman and CEO and Boilermakers International President, accepts the award from Società Cattolica di Assicurazione – Società Cooperativa President Paolo Bedoni. A DOCUMENTARY FILM produced by Bank of Labor called “Lobstermen” received a special award from Società Cattolica di Assicurazione – Società Cooperativa in Verona, Italy, this past November during the organization’s annual film festival highlighting the Catholic Church’s social doctrine. “Lobstermen” tells the story of how Bank of Labor helped lobster fishermen in Maine finance the purchase of wholesale operations to secure their livelihoods after nonunion banks had turned them down. Films by other organizations recognized at the festival also addressed the struggle of working people and the quest for social justice.